KYIV - The process of separating our train wagon from the rest of the convoy and rolling it down a grassy stretch of alternate track was achingly slow under a mid-afternoon sun. The train had just crossed the Romanian border into Ukraine, and after 15-odd minutes at a full standstill while customs officials took passengers’ passports, we endured the journey. The wagon thudded to a stop, and what followed was a polaroid series of Soviet legacy friezes. Industrial machinery I would struggle to describe converged upon the vehicle. From a yellow bird’s nest operated by a lone worker, a strain of pulleys lowered onto the wagon. Tools whirred to life, tracks groaned beneath, yells in Ukrainian filled the dense late-spring air. A man standing about 5-foot-7, but with the hands of an NBA power forward, surveyed the scene. All around us, tracks were lined with running gear, some of which was destined for the underside of our wagon. More than two decades after the fall of the Soviet Union, this is still a daily scene: Any train wagon crossing from the European side into Ukraine still has to be fitted to run the wider gauge of the old Russian rail. Sometimes metaphors fit themselves neatly into the tracks of a journey. But that yard, and the two hours spent there, were a physical reality. Here you have exited one world -- Central Europe, the European Union, The West -- and you have entered another. 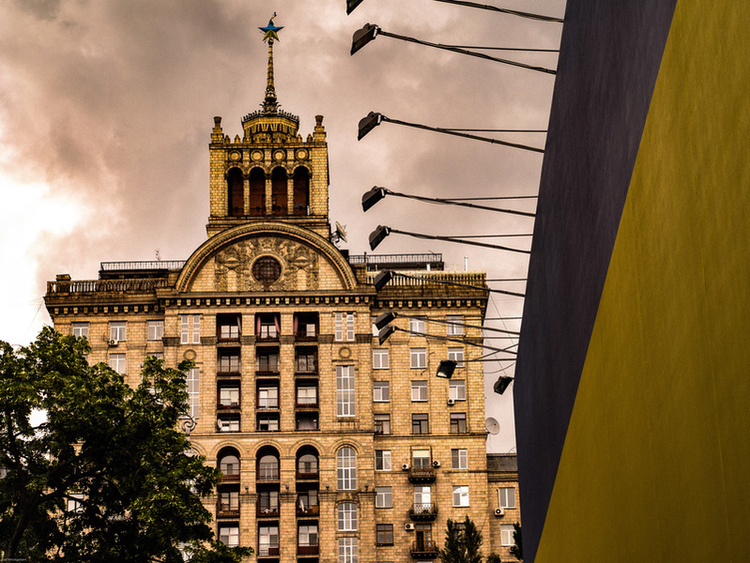 Kyiv is the right city to ponder geopolitical divisions and competing visions. Looking at Europe right now is like picking up a set of binoculars. Look outward through the binoculars, and the well-chronicled series of crises -- one of our correspondents counts six of them -- have shrunk the map around Fortress Europe, bringing the surrounding peoples and their problems uncomfortably close. Flip the viewfinder around, and the opposite is true. The nation-states inside the Continent and in its immediate vicinity have drifted apart, and see each other more from afar than they did a decade ago. Politics increasingly stop at the border’s edge. Crossing between the Hungarian edge of the Schengen zone and Romania, the EU core seems a world away. Cross out of the EU entirely into Ukraine, territory in some form contested between Western Europe and Moscow, and Amsterdam may as well sit next to the former New Amsterdam on the map. This is the feeling, anyway, and as the miles stack up on the daylong journey from Bucharest to Ukraine’s capital, that feeling grows stronger. It was the First of May in Erfurt, Eastern Germany. Outside my hotel, a heavy police presence blocked off Willy Brandt Square. Nearby, neo-nazis would later hold their May 1 march. They were to be cordoned off a couple blocks away, where they would be met, on the other side of a wall of riot police, by a motley array of leftist groups and ordinary concerned citizens. Willy Brandt Platz was set apart, completely blocked off by walls of police vehicles and personnel. Safety first, of course -- the square fronts the train station. But there were bigger reasons to keep the square clean from manifestations of the discord that has fast become a characteristic of German politics. This square is also a precious symbol of unity -- German unity, but also European. Before the platz took his name, West German Chancellor Willy Brandt, in March of 1970, looked out of its windows when he paid a historic visit to his East German counterparts. The memories of his presence in a hotel room, and of the East German crowds chanting and waving at him from the square below, have left a permanent mark on the city. At night, the message installed at the top of the building keeps a glowing vigil: Willy Brandt Ans Fenster, Willy Brandt to the Window, glows in a bold red. It recalls a time when the balance between Western Europe and East was delicate, and Brandt, who rose to political prominence as the longtime mayor of West Berlin, found himself well positioned to act as a bridge. A controversial policy at the time, Brandt’s Ostpolitik, which pursued a path of normalization with the East, offered such foreshadowings of Germany’s eventual reunification. Brandt’s pursuit of a daring policy required discipline and involved tough decisions -- and it required vision. The Germany of 2016, and its supranational counterpart, the European Union, are missing those two elements. The nature of Europe’s many crises can be boiled down to two simple realities: European leaders cannot make effective decisions -- Brussels’ mechanisms are paralyzed, while national leaders, even were they ambitious, find themselves frozen out -- and the Continent has lost any sense of shared vision. Again, the debate on Britain’s EU membership referendum, which goes to vote on June 23, provides a useful comparison between what was and what is. The Remain side lacks a positive message, and its repeated scaremongering tactics are a troublesome echo of previous EU failures. As my colleague Kaj Leers pointed out to me, in the post-mortem of a Dutch referendum on a proposed EU Constitution in 2005 -- the Dutch and French rejected the treaty, thus sinking it across the Union -- researchers found that a key turning point in the referendum campaign came when the treaty’s proponents turned to extreme rhetoric, including the specter of war’s return to the Continent if the European project did not move forward. Voters felt talked down to. As was in the Netherlands then, so it might be in Britain now. The coming months and years will show whether that consensus is dead or merely dormant. But as Europe, nation by nation, turns back toward nationalism, supporting an eclectic set of movements and parties that defy easy labels such as “populist” or “far-right,” the view from a place like Kyiv is particularly cloudy. Shortly after arriving here, I had a casual conversation with a lawyer named Nikolai. He was eager to know how Western Europeans view Ukraine, and we got to talking about the recent referendum in the Netherlands, in which voters opted to reject a trade agreement between Ukraine and the European Union. (Turnout barely crossed the 30 percent threshold needed to validate the result, which itself neither voids the treaty, nor binds the Dutch government to action.) The organizers of that vote didn’t actually care about Ukraine -- Kyiv was collateral damage, a victim of the ideological wars heating up in the West. The referendum’s organizers openly said that they don’t care about Ukraine -- their ultimate goal is to withdraw the Netherlands from the European Union. Nikolai’s way of speaking about Europe is what intrigued me. It mirrored the way some in Britain use the word -- “Europe,” “the Continent,” something external to self. The nature of that separation is vastly different, of course. On the British side, it connotes suspicion, from Kyiv, aspiration. Ukraine is a young nation looking to define itself, and a nation caught between the visions of a revanchist Moscow and a divided Europe. The second part of this memo will take a look deeper into that dynamic, and into the various forms the much-cited rise in nationalism has taken in Europe. Questions, comments, contributions? Feel free to send an email, or reach out on Twitter @joelweickgenant. And be sure to check for all of the latest news and analysis on Europe at RealClearWorld.com/regions/europe.